Lake Anna Striper Guide Journal: What do you think? For the last few years I have been posting screen shots on my journal. I wanted to see if anyone has been watching and /or learning from these posts. I popped this screen shot yesterday from my Simrad. Other than a beautiful screen shot can you tell me what is going on in this picture? Let's have some fun and respond back to me with your opinion on what is happening here. I would like to hear from my clients, followers of my journal and facebook, other guides, TV show producers, pro's and friends, other than yesterdays clients [they already know]. Respond on my journal [by commenting], facebook or forum sites. I will repost the picture later in the week with a detailed explanation. Thanks for your responses. Enjoy! I study each of the pics posted. This one looks to me like a school of bait near the surface with some Gizzard hanging in the middle. Near the bottom are some stiper contemplating their daily intake. I havent seen the diagonal lines quite so pronounced -- could be fishing lines, or some stipers hitting at bombing speeds. Side scan shows bait to the right of the boat. Keep up your good work and teachings! Not having speed makes this tough. However, I would guess that this is a few stripers that are following a striper that is getting reeled in. It appears to me that at first, the stripers begin to rise in the water but are swimming away from the cone. Then they come back to the boat and then split. You have been a good student. I will let you know in a day or two exactly what it is. Dr.BumpAss..Great Name...The lack of a speed reading does affect how to interpret what wee are seeing. Usually I need to know the speed and sensitivity settings to evaluate the screen. 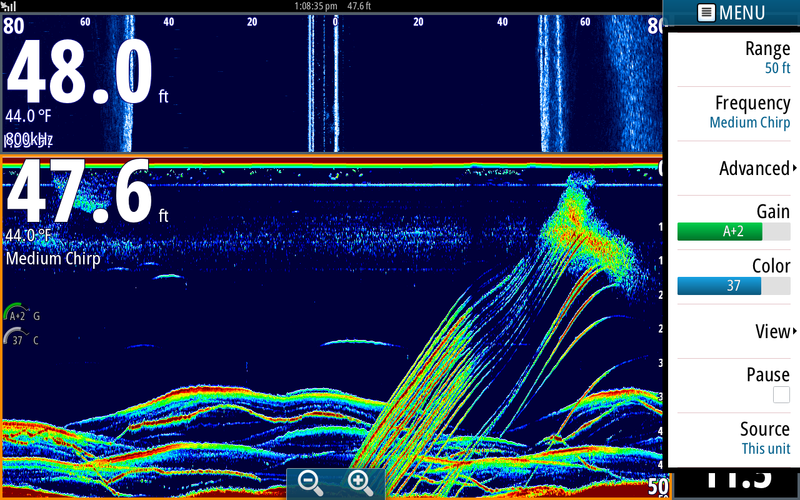 A hint, the diagonal lines are not Stripers and they are feeding on the school of bait up near the surface. Stripers were near the bottom all day long. Looks like stripers came into some that was on the bottom and pushed them to the top. The diagonal lines are the bait making a mad dash to the top.